I have talked probably incessantly at this stage about online audiology marketing. I hope I haven’t bored you to tears. I had a conversation with someone the other day about online strategy. I quickly realised that perhaps I had Only vaguely touched on overall strategy for online audiology marketing. So I would like to take the time to outline a strategy that would fit with the brand and ethos of the large part of hearing healthcare Practices. The key component of your online audiology marketing strategy is your website. Your website is the linchpin of the strategy, everything else supports or leverages your website. Your online audiology marketing strategy is a component of your overall marketing strategy. As I have said before, online channels are imperative, they are of growing importance, but they do not replace your traditional marketing channels. In fact the complete opposite is true, they support and work alongside your traditional channels. As you can see new and traditional channels will run side by side in your overall marketing strategy. As in traditional marketing you have inbound and outbound channels. 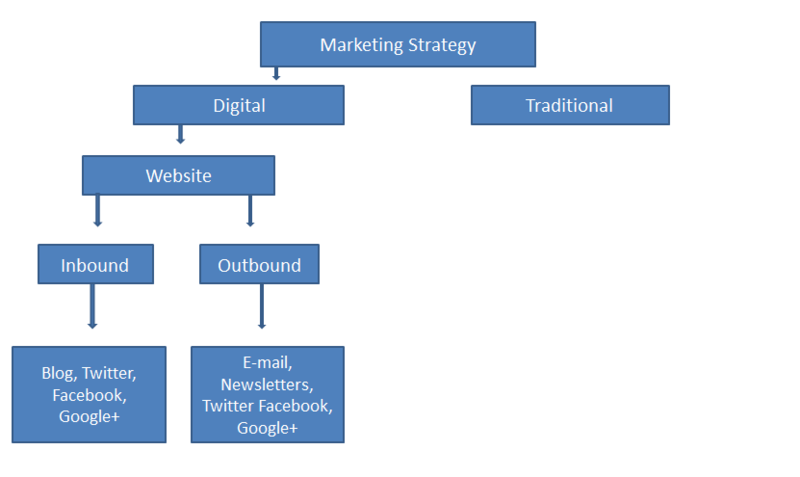 Although when you move towards social media the lines blur somewhat between inbound and outbound. Mainly because Twitter, Facebook and Google+ can be used to deliver marketing offers to specific targets. The king of digital inbound marketing, in fact the king of all digital marketing is content marketing. This term was coined a couple of years ago to describe the use of blogs to support inbound marketing. The main tenet of content marketing is to generate content, blog posts, of real interest to your target market. In every case and in every industry that involves posts around product, services, support etc.. The key with content marketing is that it needs to not look like marketing! Sounds counter productive, but it is not, you would not be reading this post, thinking how brilliant I am, if it weren’t for content marketing. I hope you are used to my humour by now, in my defence I am Irish. So your online marketing strategy is to use content marketing, supported by social media channels to boost traffic to your website. You can then optimise your website to convert traffic to leads. So whilst all the above is lovely and informative, let’s look at how you actually put it into play. Write a blog post that is informative, of interest to your target market, that supports and is linked to an element of your website. One such post could be in relation to cleaning and care of hearing instruments. Ensure that you search engine optimise that post using key phrases for local searches pertaining to cleaning and care of hearing aids. Support that post with linked posts on your social media channels. You can also vary those posts over time with links to the element page on your site. The posts on your social media channels should also use wording that localizes the key phrases. Voila, you have just taken a step in your online audiology marketing strategy, now rinse and repeat. Audiology Marketing, Hearing Instrument Marketing. Bookmark. Your Consultation, Have You Looked At It Lately?